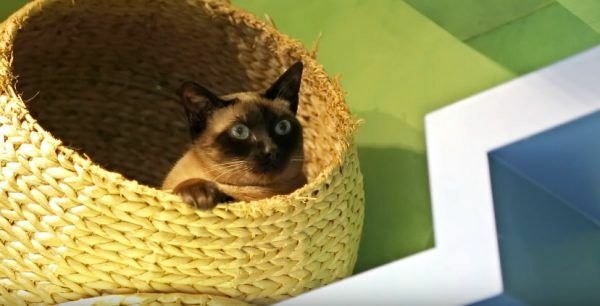 If you love cats and love watching them play then you need to know the name of Californian cat jungle genius, Peter Cohen. His story starts in 1988 when he bought a house, and with that house came two feral cats. After a tragic car accident one of the cats sadly passed away, and he adopted the other to keep it safe. After feeling that their new pet was lonely without a buddy, they went and adopted some more cats from a local animal shelter. This is where it got interesting. In 1995 Peter built the first of many catwalks for his house. This began the creation of the now bright and colorful indoor cat playground they have in their home. The walks are placed throughout every room of the house and are made from many shapes and designs like spirals, tunnels, and even one that's shaped like a shark head, whose teeth scratch the cats as they walk through it. 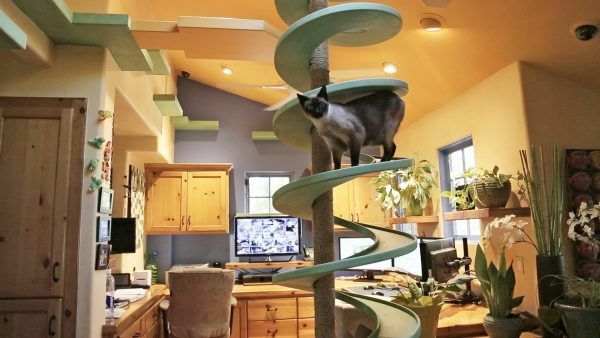 He claims he has spent over $50,000 on the best walks for his cats, so not only must Peter enjoy the look of the walks but surely this is a dream home for every cat! From then on Peter started adopting cats from different shelters every year and before they knew it there were 15 cats calling the indoor playground home! But, according to Peter and his family, since the cats love the house so much and are always off exploring, it really doesn't seem like they have that many at all. Check out the video below to see more about this kitty-cat wonderland! Just great to watch! I wish I had a house like your’s!